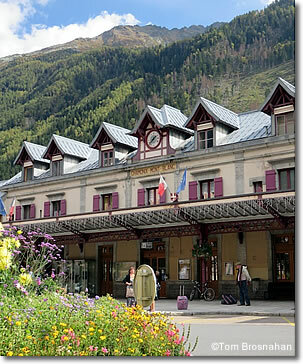 It's easy to go to Chamonix by car or train, and easy to get around by local bus. Nestled in the highest mountains in western Europe, Chamonix-Mont Blanc takes a bit of time to get to, but it's not difficult, and it's well worth the trip. From Lyon to Chamonix, (223 km/139 miles) about 2.5 hours. From Geneva, Switzerland (82 km/51 miles), about one hour. The A40/E25 autoroute zooms southeast from Geneva to Saint-Gervais-les-Bains, then becomes the N205 highway as it enters and passes through the Mont Blanc Tunnel to Italy. Just before the tunnel entrance, D1506 begins and leads northeast up the Chamonix-Mont Blanc valley to Chamonix and Argentière before reaching the Swiss frontier. The fastest train time from Paris (Gare de Lyon) to Chamonix-Mont Blanc is about 5 hours and 39 minutes, changing trains twice: at Bellegarde, and at Saint-Gervais Les Bains. Other trains go via Annecy and San Gervais, and take just over 7 hours. From Lyon (Part Dieu), with at least five daily trains, the journey takes between 4.25 and 4.45 hours, changing trains at Bellegarde, or at Bellegarde and Saint-Gervais. Chamonix has a heliport and small airport for excursion flights over Mont Blanc, but the nearest airports with intercity service are Geneva International Airport and, a bit farther away but still practicable, Aéroport Lyon St-Exupéry near Lyon.